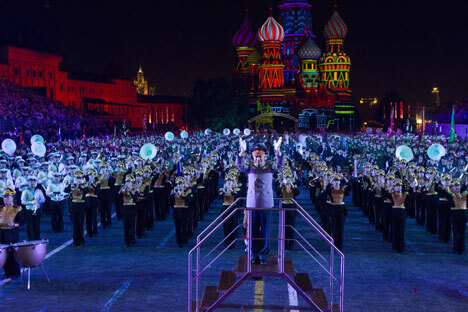 RIR’s Dimitry Romendik reports on the annual military music festival that was spectacular, colorful, and at times emotional. "For me, performing in the country's main square is an adrenalin rush,” Yevgeny Filatov, a clarinet player with the Central Naval Orchestra, told RIR. “This isn’t my first performance in Red Square, but each time I feel a particular joy." The Russian Navy orchestra, headed by Captain 1st Rank Alexei Karabanov, makes regular appearances at the Spasskaya Tower festival. "I served in the Irish army for 23 years. I retired several years ago and decided to form an orchestra, inviting musicians from both the Republic of Ireland and Northern Ireland," he told RIR. There are 53 musicians in his orchestra now - from both countries. They were one of the first to walk into Red Square, and performed "Katyusha", one of the best-known Russian songs of World War II.